On Thursday, April 19th thevillage ofSabastiya received a special guest: the archbishop of Krakow, S.E. Stanisław Dziwisz, who in fact went personally to visit the Palestinian town, accompanied by Father Jerzy Kraj ofm and by Carla Benelli, an ATS pro Terra Sancta collaborator. After having visited the historic center of Sabastiya, its Crusaders’ chapels and the tomb of St. John the Baptist, and after having seen the new Guesthouse and assisted in the work that the boys are developing in the Mosaics Laboratory, the archbishop said he was “profoundly delighted” about the conservation and improvement work that is being carried forward in Sabastiya. 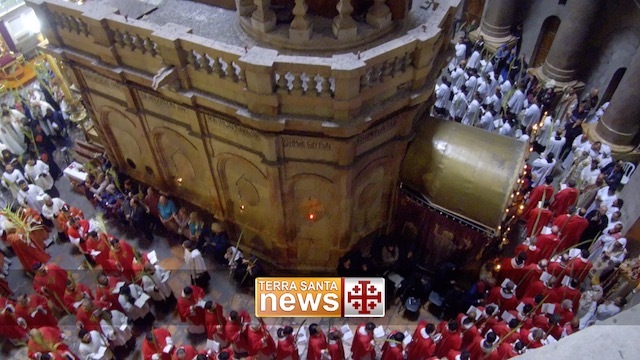 “Continue on!” he said, referring to the project that ATS pro Terra Sancta is carrying out for a number of years, involving the local population as management and improving the historical and cultural heritage. The group also paid a visit to the construction site- always open and visible to visitors that pass through the village- where work on the construction of the new conference room is steadily proceeding. At this moment the paving of the large Crusaders’ room in under way, that will be used for meetings, conferences, and large events.